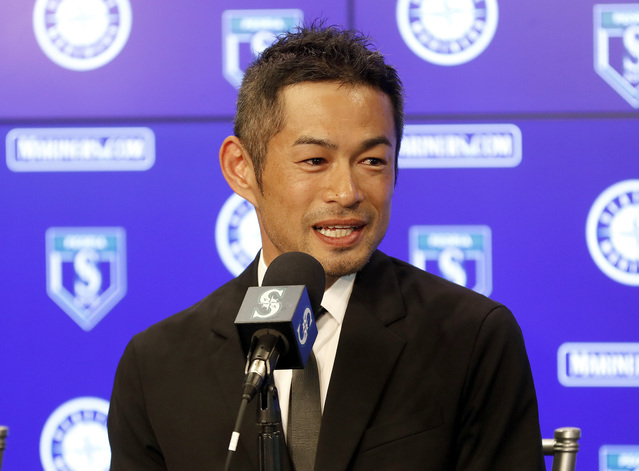 Ichiro Suzuki may no longer be the same star who established his Hall of Fame career in Seattle, having teammates now who aren’t much older than his own kids, but his return Wednesday was greeted as if it was 2001 all over again. Suzuki, wearing a conservative black suit and white shirt, was hugged, kissed, and mobbed the moment he entered the Mariners’ spring-training complex. There were 50 reporters and photographers snapping pictures of his arrival. He took questions for 45 minutes in a press conference. And when he came back to the clubhouse and put on his old uniform, his teammates acted as if they just signed a combination of Mike Trout and Bryce Harper. “I-chi-ro! I-chi-ro!” Mariners center fielder Dee Gordon chanted. Mariners fans swarmed the practice fields hoping for a glimpse of him – his first workout will not take place until Thrusday – and suddenly, it was if All-Stars Felix Hernandez, Robinson Cano and Nelson Cruz were relegated to backup singers. There’s only four players left on the Mariners roster since Suzuki departed in a July 2012 trade to the New York Yankees, but every man in the clubhouse knows what he symbolizes, a future Hall of Famer and link to the Mariners’ greatness of years ago. Why, his magnificent rookie season in 2001 was the last time the Mariners were even in the playoffs, and although he’s 44 years old now, and hasn’t been an everyday player since 2013, it’s as if he can resurrect the magic from the past. When the Mariners and Suzuki parted ways, it was uncomfortable. Suzuki, tired of all the losing, wanted out. And the Mariners, watching Suzuki become almost a recluse in the clubhouse, needed him to go. Yet, just when it looked like his major-league career was over, an aging veteran in a flooded free-agent market, the Mariners came to the rescue, bringing him back home one more time. This likely will be Suzuki’s final season, if he even makes it all year. Every other team in baseball passed on him all winter. The Mariners did too, but when suddenly hit with a slew of injuries, losing outfielder Ben Gamel for six weeks, Dipoto called agent John Boggs. Boggs, whose pleas to other GMs went unanswered all winter, called Suzuki. He was coming home one last time. “Somewhere deep inside,’’ Suzuki said, “I wanted to return and wear this uniform again. “Seattle has always been home. It wasn’t (really) home, but it was really home to me. It was such a close place to me but actually it was far because I was in a distant place. Suzuki, who’s at least 14 years older than the other Mariners outfielders, jokes that it’s as if he’ll be playing with his own children. He’s only six years younger than his own GM and manager, Scott Servais. The Mariners, who are paying Ichiro just $750,000 with incentives worth $1.25 million, say they wouldn’t have signed him if he didn’t think he could contribute. They’ll sell at least $750,000 worth of tickets and Ichiro merchandise, but insist this isn’t a marketing stunt. “I certainly have enough amount of respect for what Ichiro has done in Seattle in his career,’’ says Servais, “an unbelievable career. But I think everybody within the organization felt like where we’re at right now, what he brings to the ball club. The Mariners value not only his production, but his presence in the clubhouse, where he can be a role model to some of these kids who weren’t even born when he started his professional career in Japan. It doesn’t matter that he’ll be only a fifth outfielder and a lefthanded pinch-hitter, this is not only one of the greatest players in Mariners history, but in all of baseball, with more hits (4,358) than any man who has put on a uniform. Who knows, perhaps he will be the perfect mentor to Shoehei Ohtani, the 23-year-old Japanese rookie pitcher/DH with the Los Angeles Angels. Ohtani sent Suzuki a text message the moment he signed with the Angels, and they met several times during the winter. The room burst with laughter. The Mariners, who never gave out Suzuki’s uniform number, 51, since he left, which also belongs to Hall of Famer Randy Johnson, will certainly retire it the day he walks away from the game. Yet, it may be awhile. Ichiro, who always said that he wanted to play until he was 50, clarified his mantra. As his Seattle return proves, anything is possible.